I feel like I have been anticipating spring's arrival since January :) And now we're already into March and the days are getting brighter and warmer and this girl here could not be any more happy about it. 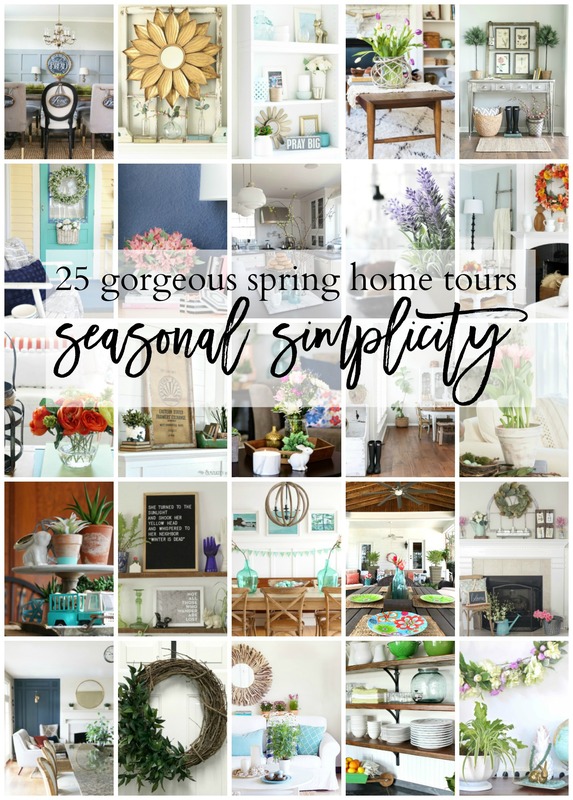 Today I'm really excited to get to share my Spring Home Tour with you as part of a fun new Seasonal Simplicity Series hosted by April, from House by Hoff and Krista, from The Happy Housie. 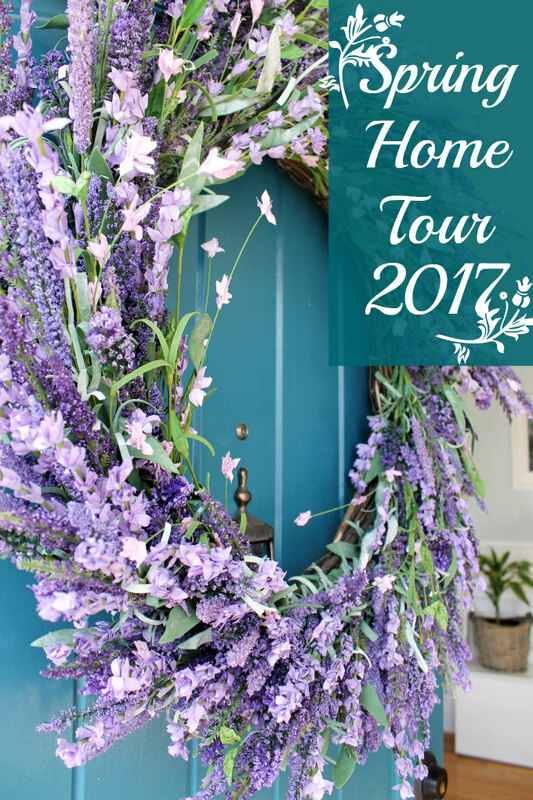 Today is the last day of this week long tour, so when you're done here be sure to go see all of the other bloggers and their beautiful decorated homes. I have provided all of the links at the end of this post. If you are already following along on the tour, then you should be coming from My Fabuless Life. Jen's home is always decorated so cute. Welcome to my little 1924 cottage home. 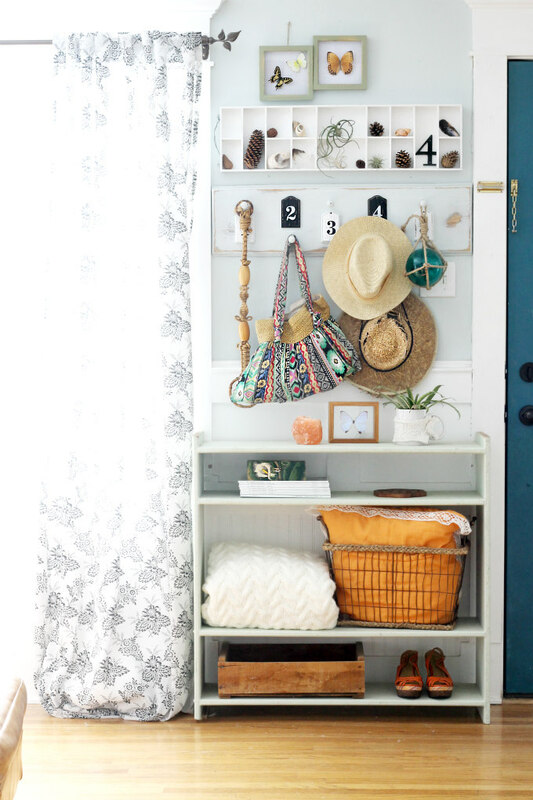 I've also already shared more of this entryway look in THIS post, but it looks so cheerful that I had to add a picture of it to this spring tour. Okay, so usually when I share tours of our home, I always start with the living room, but today I thought we'd first head into the sunroom. This room is my very favorite after all. This room has a wall full of old windows and one of my favorite things to do on a nice spring day is open them all up to let that warm fresh air in. The Flower Market pillow and the Daisy Peace sign pillow are ones that I created with my sister. I am actually selling them, along with a few other variations in my etsy store. I just adore these pillows and I keep finding myself moving them around our home because they look cute anywhere I place them. Okay, now we'll head into the living room where I have added lots of pops of color. 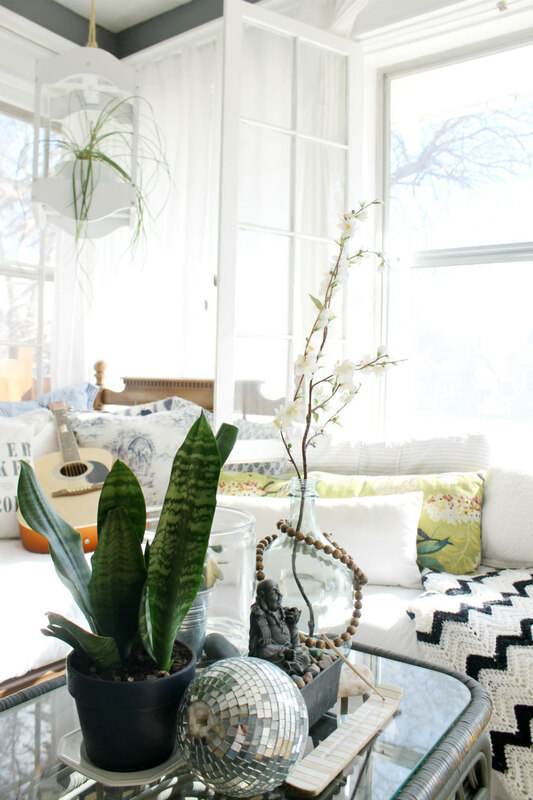 Doesn't this room just radiate Spring? I think so. 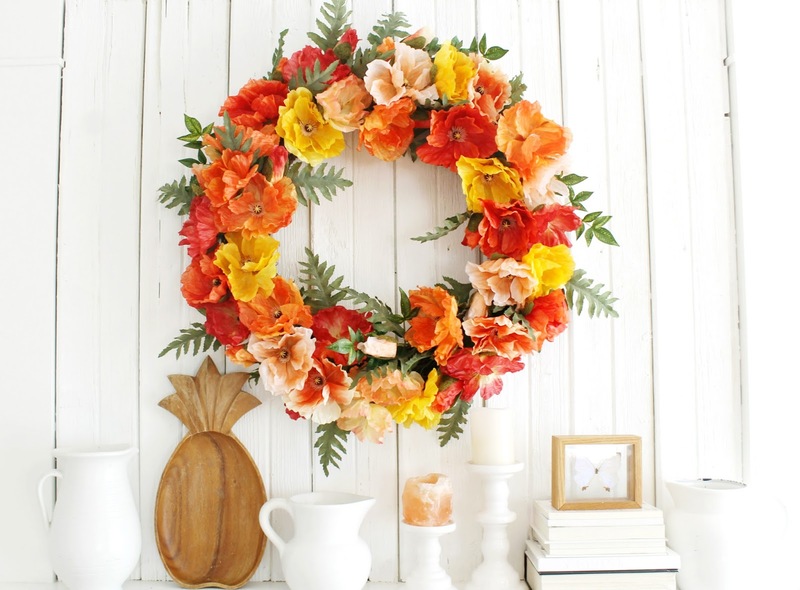 The inspiration for the room all started with this AMAZING Poppy Flower Wreath. It's also from Balsam Hill's new spring floral collection. It is definitely the star of the room. 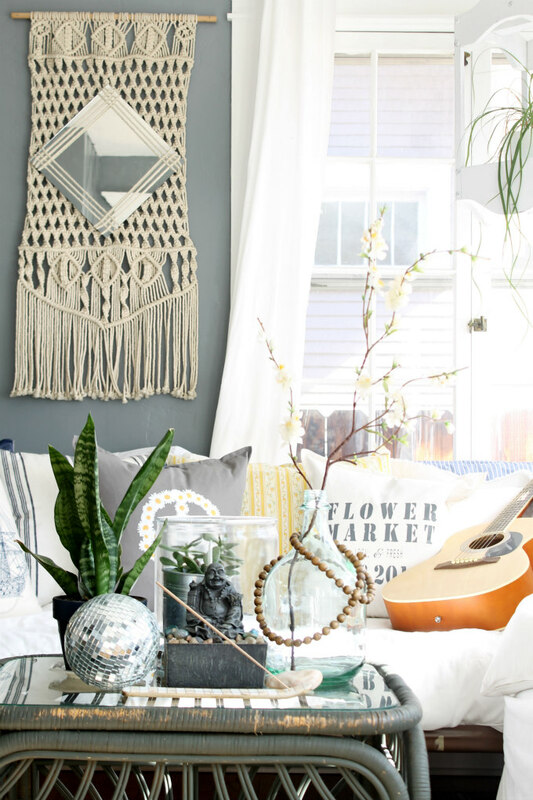 So taking from the bright hues of the poppies, I shopped around our home for colorful pillows and artwork to bring into the room. And with thoughts of spring, I also brought in pictures of flowers and butterflies along with some of my grandmothers straw hats. 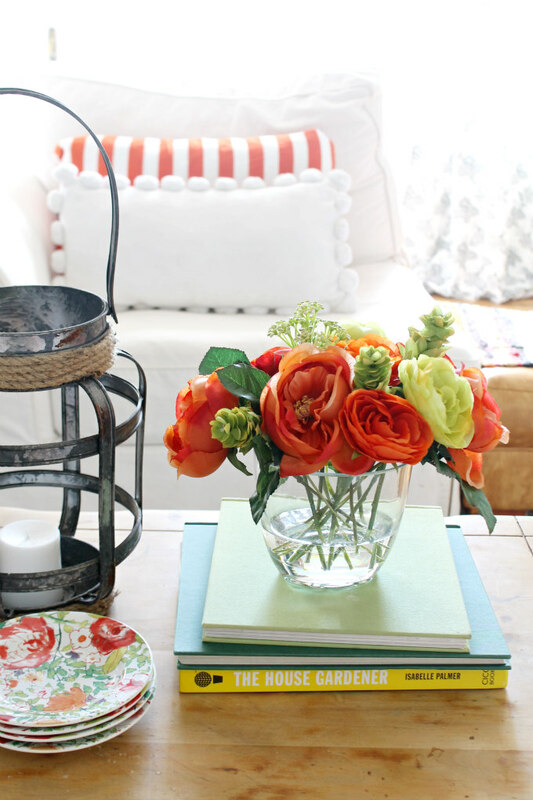 Sitting on the coffee table is another beautiful floral arrangement from Balsam Hill that I have placed on a stack of my favorite books. 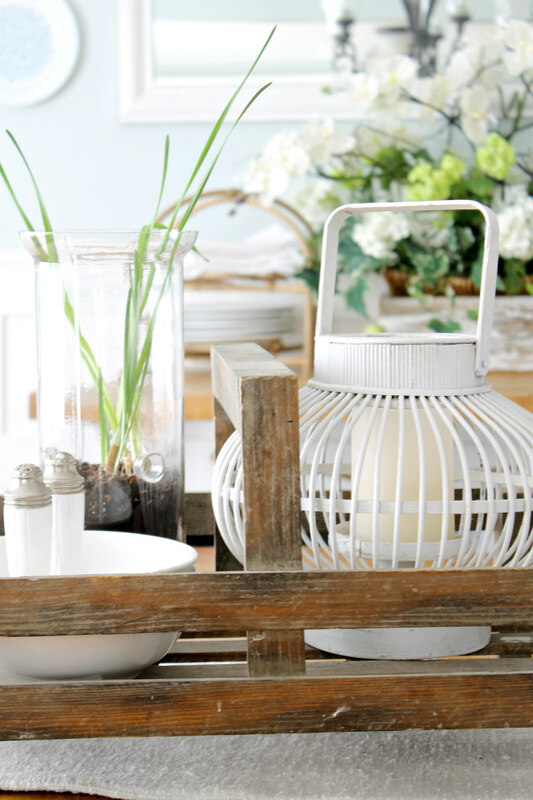 The lantern is from Hayneedle and the small plates, that I like to use as coasters, are originally from Homegoods but I picked them up at the Goodwill. Let's move on into the dining room. In here I was going for a garden look so I brought in a lot of plants and greenery. 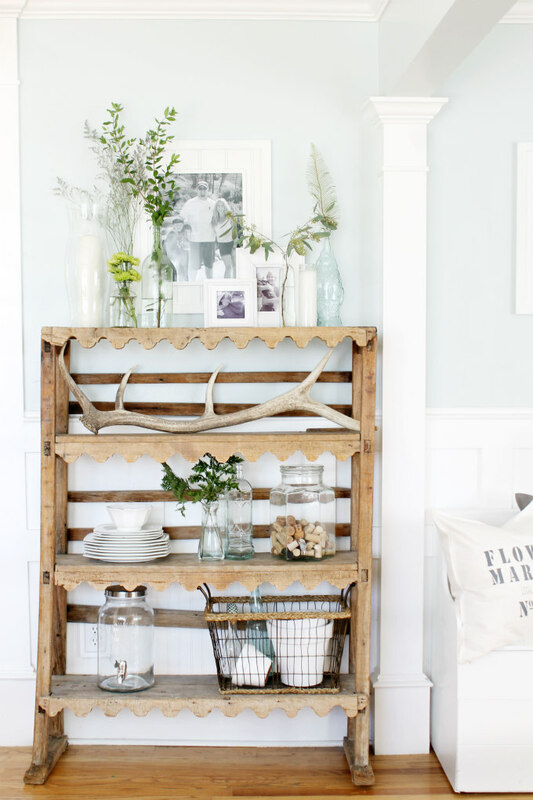 My antique shelf got a fresh look with touches of glass and branches. Okay, I hope I haven't bored you too much yet, but lastly, I want to show you my bedroom. 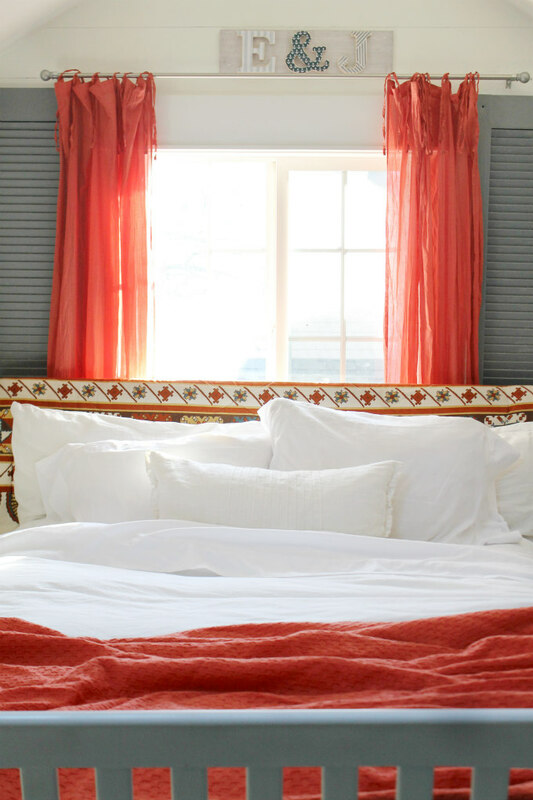 I actually found these red/orange curtains at the Goodwill but they are originally from World Market. This is why I love the Goodwill, I would never walk into World Market and buy red curtains. But when I saw them at the Goodwill for only $4.00 I just had to have them. The Goodwill has a way of pulling me out of my comfort zone. I never would have thought to add this color to our bedroom, but it works. Oh and on the same day, I also picked up the same color bedspread also at the Goodwill. It was a good shopping day for me :) I covered my headboard with a vintage Coleman sleeping bag and it just kinda brought all of the different colors in the room together. And that concludes my Spring Home Tour! 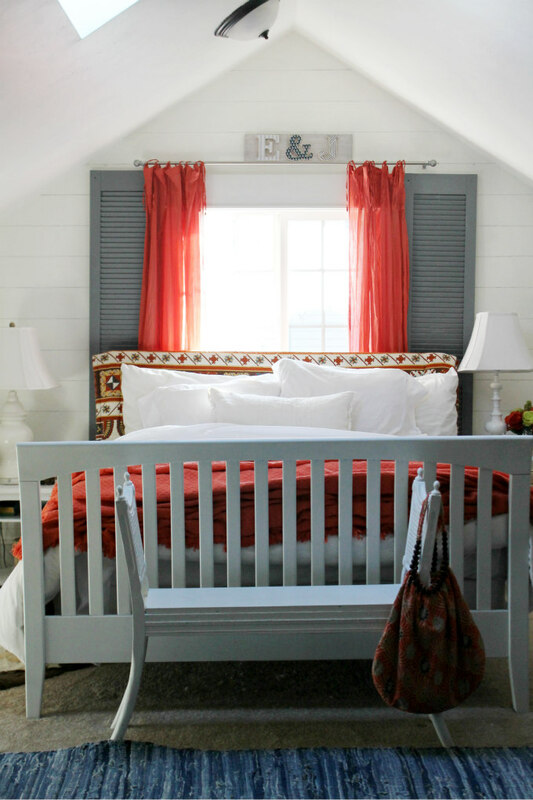 I'd love to hear your thoughts, Do you have a favorite room in our home. Let me know in a comment below. Also you can find me on Facebook & Instagram. beautiful, emily! i love your office space always, and your entry looks so bright and cheery! 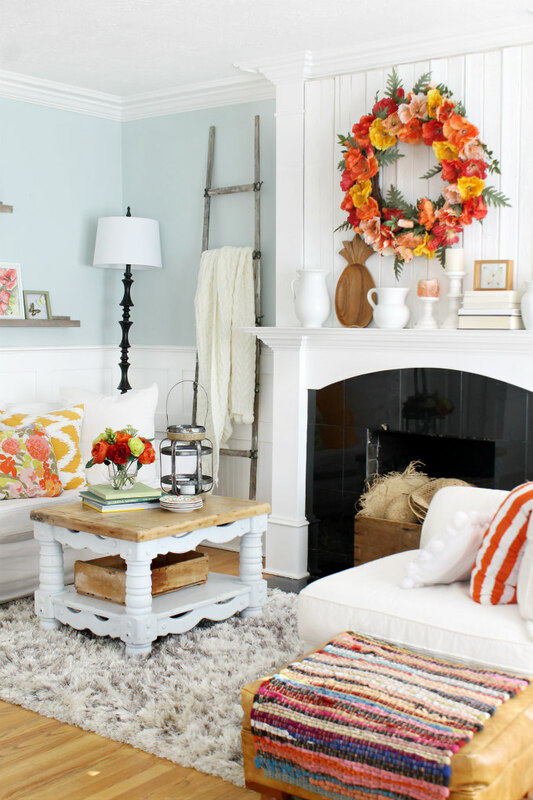 the living room is so fun right now with the bright bursts of color! Emily it's so pretty, I love all the light in your photos and the pops of orange are so fresh and cheery. So nice. Wow, your home is gorgeous, Emily! 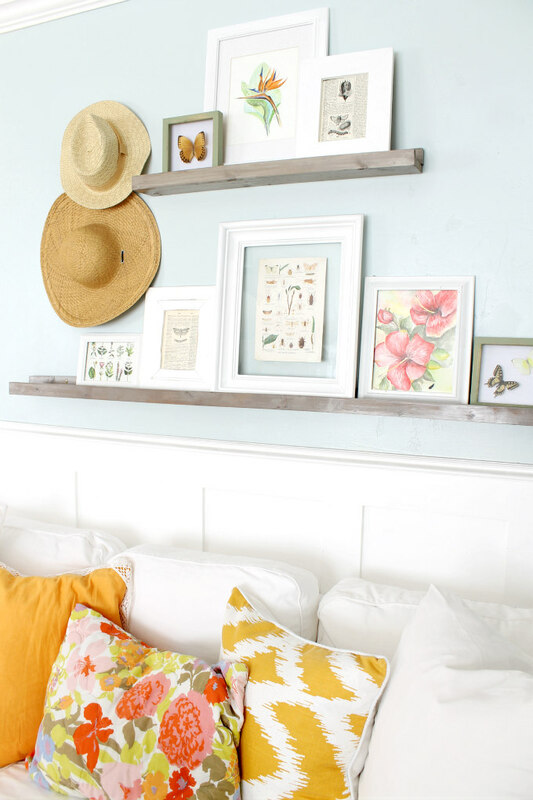 Your sunroom and living room just radiate Spring and can we talk about how good your antique shelf is??? So, SO good. Your home and photography is stunning, Emily! 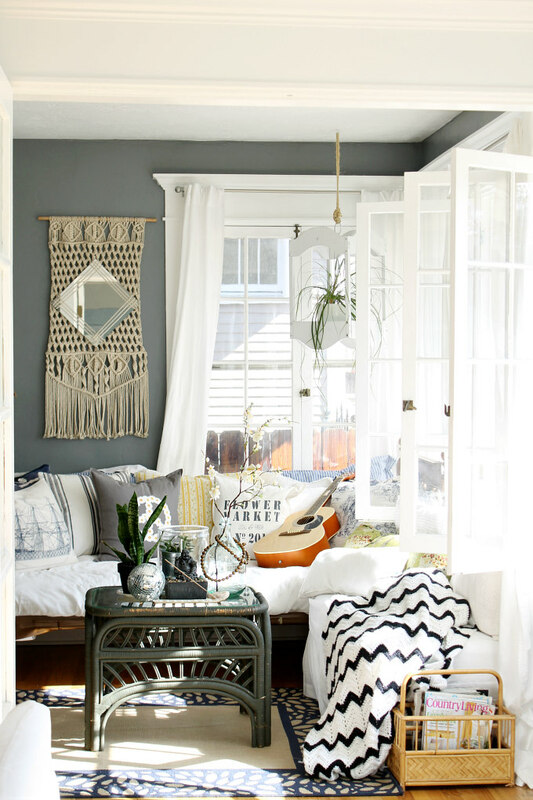 Your style is such a cool combination of beachy and bohemian...so eclectic and gorgeous! So glad you could join us on the tour! 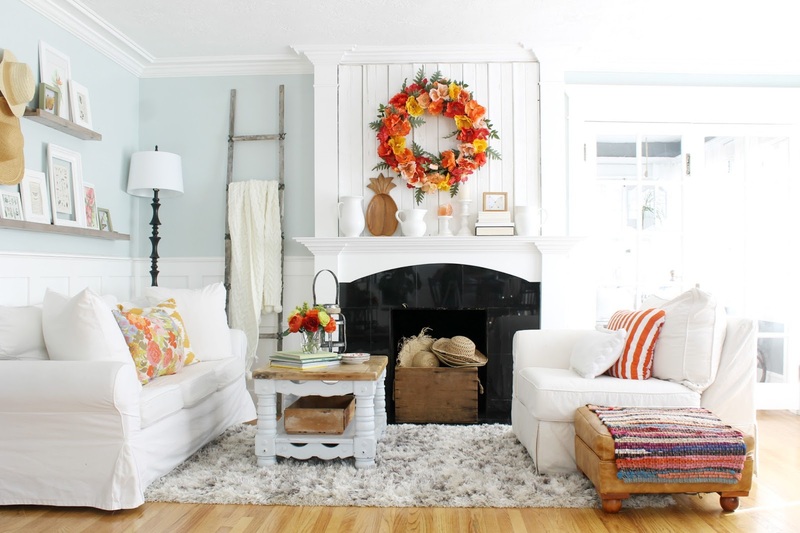 Your home is so pretty, bright and ready for spring! 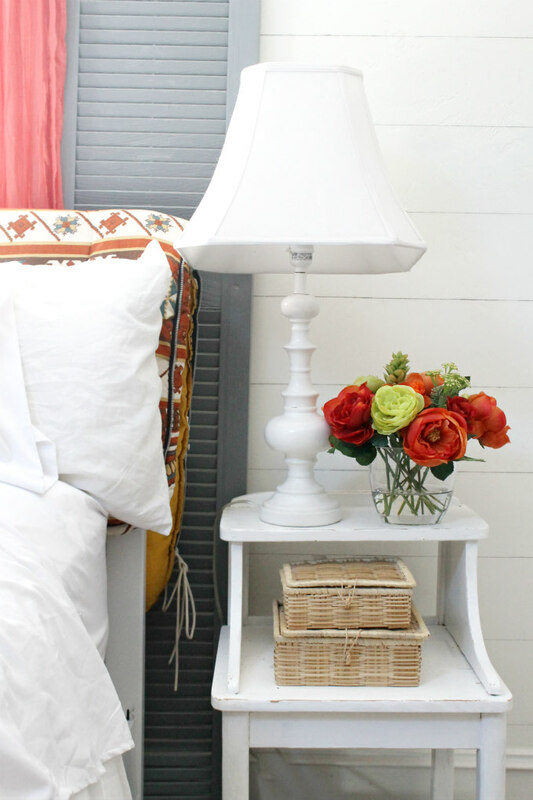 I love all the pops of color - especially the yellows and oranges! 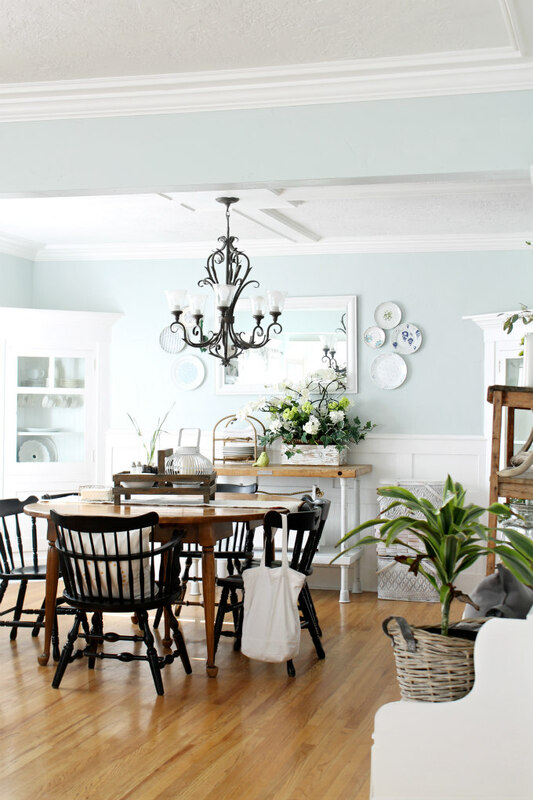 Love your home it's so much fun and really beautifully decorated for spring! Hey Emily, your home is astonishing and beautiful. 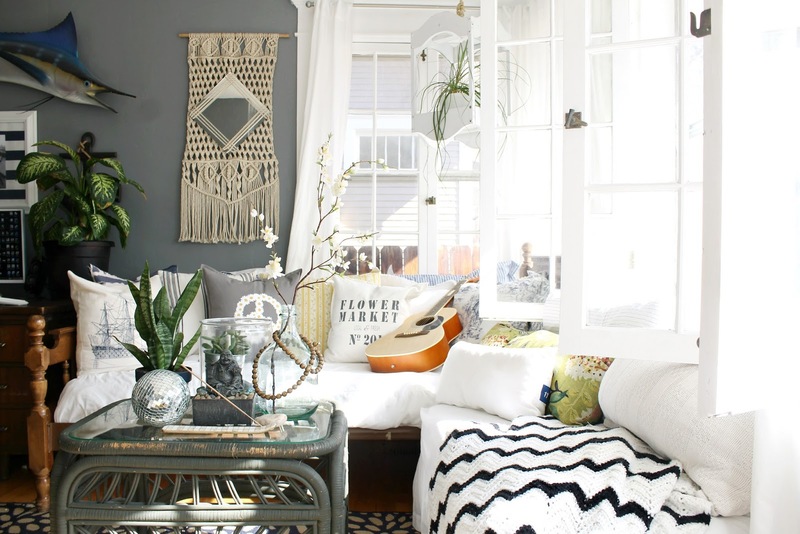 I love the colors, wall hanging, pictures, decoration, and furniture. In fact, I love everything about your home. Love reading the blog. Thanks.